For the first time in 15 years, most of the inmates in the Spokane County Jail are allowed out of their cells with access to books, TV, showers, the phone, games and the rec room. All floors except 6 West, which holds maximum security inmates, and the all-female floor, are now on direct supervision. 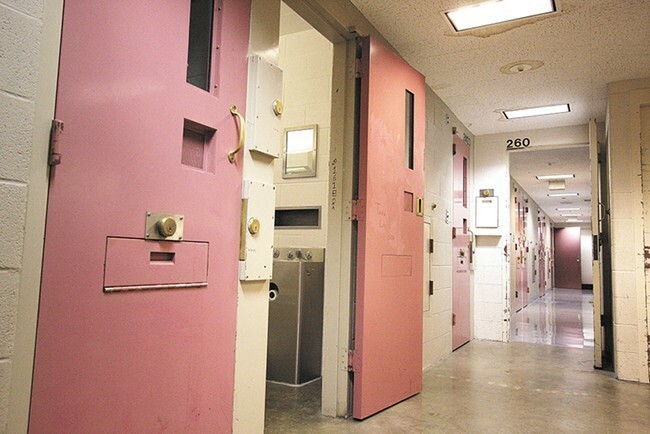 "The research is very clear that the direct supervision model creates a safer environment inside jails and prisons," says Jacquie van Wormer, criminal justice administrator for the Spokane Regional Law and Justice Council. "There is less stress, less grievances, less serious incidents, less infractions when you have that sort of a system." Direct supervision is an inmate management strategy where corrections officers interact directly and continuously with inmates to deter problematic behavior. The change comes after negotiations between the corrections officers' union and jail administration cleared the way for officers to work at both the county jail and Geiger Corrections Center, says jail director John McGrath. Previously, corrections officers weren't allowed to float between the two facilities, which created inmate-to-officer ratios that made it unsafe for inmates to be out of their cells most of the day. "The population has been kind of stagnant," McGrath says. "So with that we were able to look at current bed space and break down classification levels. We had an abundance of minimum security inmates that we could then relocate to Geiger if we were to send more staff members out there to supervise them." The jail's return to direct supervision was also called out among recommendations from the National Institute of Corrections, a federal agency within the Department of Justice. • "Ensure that inmates with urgent medical or mental health concerns receive timely health assessments at the jail and/or transferred to the emergency room for these assessments. Within 14 days after the admission to the Spokane Correctional Facility all inmates should receive a health assessment." • "Ensure that discharge reports on inmates released to the jail from outside hospitals accompany the inmate to the jail and are immediately provided to the jail medical staff for their immediate review. Similarly, ensure that facility medical information connected with SHUTTLE inmates accompany the inmate to the Spokane County Jail and are reviewed by health care staff." • "Improve levels of sanitation throughout the facility. Set and enforce expectation for appropriate levels of sanitation through training of staff and inmates and routine internal inspections." • "Continue with refurbishing of housing units. Some units, which have not been recently refurbished are in need of cleaning, painting and repair/replacement of furnishing fixtures." • "Provide ongoing specialized training in high risk/liability areas including suicide prevention, managing inmates and mental illness, etc." • "Work with the union to ensure flexibility in determining when, and if, a second officer is required to be assigned to a housing unit. It is not uncommon, given the proper tools and support, for a housing unit officer in more recently constructed facilities to effectively manage 64-72 inmates in a direct supervision environment." Van Wormer says the improvements also come as a result of jail administration's reliance on data and commitment to reducing overcrowding, a requirement of the $1.75 million grant from the MacArthur Foundation. "I think the jail has really improved over the last few years with their use of data, their offender management system and thinking about needed changes through a data lens," she says. "This is a prime example. This happened because of data analysis." When it was first constructed, the Spokane County Jail was intended to be a direct supervision facility with a 1 to 46 ratio of guards to inmates. With staff shortages and an inmate population constantly pushing past the 462 inmates it was originally designed to hold and past the 188 additional beds added later, inmates were kept locked in their cells almost the entire day on weekdays and were on lockdown all weekend. "This makes life easier for the officers," McGrath says. "They can interact with the inmates and see how they interact with others. They have more access to normalcy where they can watch the news or go to their cells and take a nap."